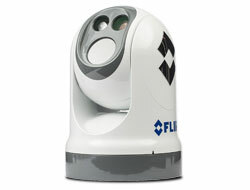 The FLIR M400 thermal night vision camera is a versatile, high-performance pan / tilt marine camera system designed for best-in-class short and long range target identification. 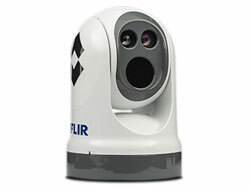 The FLIR M400’s advanced 640x480 sensor delivers crisp thermal video images in total darkness and low-light conditions. An integrated HD color visible camera and tight-beam LED spotlight augment target identification for added safety. The FLIR M400 has a continuous optical zoom lens (up to 4X) that allows operators to see other vessels and targets at longer ranges. Active gyro-stabilization ensures a steady image, plus radar tracking and optional video tracking keep potentially dangerous targets in view at all times. Radar tracking identifies and tracks specified radar returns, enhancing vessel safety when visibility is low. Step up to the M400XR with integrated video tracking. Lock on and automatically follow objects as long as they’re in view of camera. Digital Detail Enhancement (DDE) assures a crisp thermal image, even in scenes with extreme temperature dynamics.